Add 4 Tablespoon of Oil and heat. Add 8 Medium Onions sliced straight and cook till Translucent. Add Goat Meat (1000gms) cut in approx 1 inch cubes. Stir. Add Ginger Garlic Paste (freshly made) 2 tablespoon. Stir. Add 12 cloves, 6 Cardamom. Stir. Add 4 Cinnamon Sticks full. Stir. Add 1 Tablespoon of Red Chili, 1 tablespoon of turmeric powder, 1 Tablespoon Biryani Masala, 4-5 Bay leaves, 1 teaspoon cumin powder, 1 teaspoon Coriander powder, 2 pinch Black pepper, 2 tea spoon Cumin seeds, 4 Black Cardamoms, Dry plums about 15. Stir. Add 1 liter water and salt as per taste and 3 full Green chilies large. Stir well. Cover and let cook for 45 mins on medium flame. After the 45 mins of cooking of Mutton add cut tomatoes (large slices) mint leaves and coriander leaves. Stir and cook for another 10 minutes. The mint and coriander leaves will leave their flavor on the meat if covered well. Soak Basmati Rice separately for 30 mins (1000 Gms) then add 5-10 green cardamom cloves and cook separately. Divide the cooked rice in 2 portions. Soak 1 Large tablespoon of saffron in 25 ml Milk for a while. Take 1 portion of the rice and toss 1 tablespoon Olive oil in it. This will help each rice grain separate well and become non-sticky. Mix the entire content to the portion of the rice. Watch the color of each grain go Yellow/Red. Keep separate and Handy. Take a large Bowl (3 Liter capacity) brush the inner side of the bowl with a thin layer of Olive oil. Spread a layer of the plain Basmati rice (75% of the total) at the bottom of the bowl. Then spread the entire mutton as a second layer over the Rice. Spread 75% of the saffron rice above it as a 3rd layer. Spread chopped large slices of Tomatoes, Full Mint Leaves and Cut Green chili (2-3) over the 3rd layer. Put Boiled potatoes (about 6) cut in 2 halves along with the Mint leaves and make a 4th Layer. 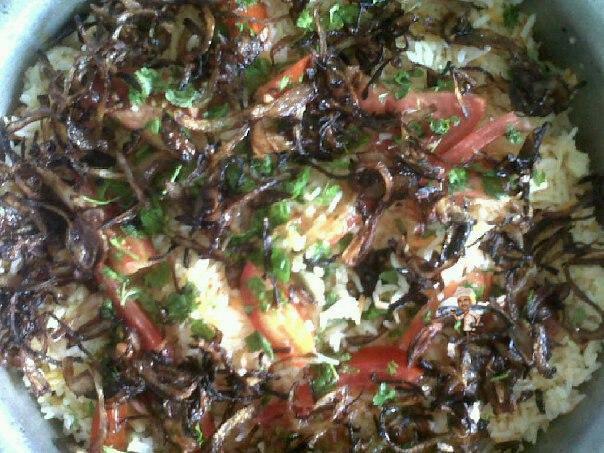 Spread the remaining 25% Basmati rice as the 5th Layer above it. Spread the remaining 255 of the saffron rice as the 6th layer and garnish with deep fried, dark and caramelized Onion rings on top. Also garnish with more Mint leaves, sliced tomatoes and chilies as per taste. Optional: Add about 250 gms of dry fruits on top of it (cashews, almonds, walnuts etc) as per your choice.